"Have a hard time going home at night. Too much fun working." In the last section we looked at the various factors that contributed to the respondents’ choices of their occupations. In this section we are going to examine their feelings about the jobs they have chosen. Inevitably, there is a lot of overlap in the language they used when replying to these two different lines of questioning: more often than not, the reason a person chose a job turned out to be validated in their work experience. The reader will recognize some of the same people they met in the last section as they read this one, but many significant new factors emerge as they talk further about their work. The job that I have now is very close to being my ideal job. I’m the administrator for a town’s Conservation Commission. I’m essentially in charge of a wide range of environmental work in the town, both from the standpoint of reviewing and permitting construction projects in or near environmentally sensitive areas, as well as managing about 550 acres of conservation land almost from a park ranger standpoint. And it’s terrific – I love the people I work with, I love the town, I’m given a lot of freedom to structure the work environment in a way that meets my needs -- it's terrific. Being at the local level really helps. When I worked as a consultant to the federal government, it was just so far removed from what was happening on the ground. I mean, I might be writing a report that would help create a policy that might be used by a local organization to do something in a particular location, but then again it might not, and even if it did I wouldn't know about it because the end result was so far removed from the work that I did. So I really like working at the local level where I can see the results and the fruits of my labor right in front of me. I work on so many different things in my job and they’re really all interesting to me. The only part of my job that I don't like is the law enforcement side of it; if people are committing violations of the State Wetlands Protection Act or the Local Wetlands Protection Bylaw, I have to issue fines, violation notices and enforcement orders, and tell them to clean up the mess or replant trees that they’ve cut in prohibited areas. That can involve conflict and nobody likes conflict. I can handle it, but it's not my favorite part of the job. Aside from that, everything else I do, I love. I'm really in the right place. In the above passage, teamwork, location, autonomy, fulfillment, variety, public service, are all seen to contribute to the respondent’s high degree of pleasure in his work. Figure 12 displays the full range of reasons given in the interviews for finding work satisfying. The reason that appeared most frequently, by a good margin, was “service to others”. Other factors that appeared to stand out were“challenging work, “meaningful work, relating to other people, fun” and hands on work. 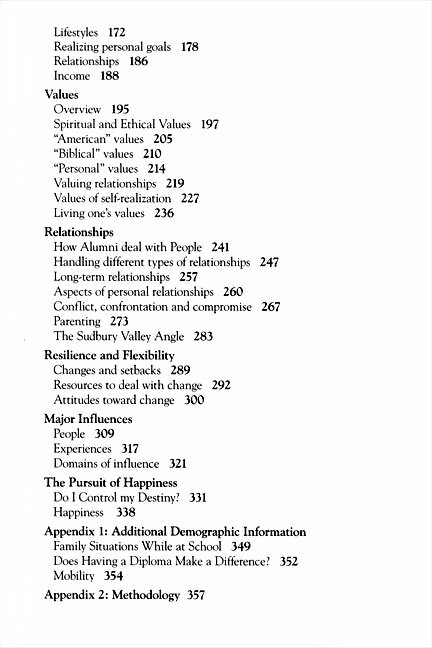 In the Chapter "Who the Alumni Are", Figure 6, (p. 20) we saw that forty-three of the respondents had spent seven or more years at the school -- that is, they spent at least part of what would have been their elementary school years, as well as what would have been their middle and high school years, at Sudbury Valley. When analyzing respondents’ replies throughout this work, we routinely compared the distributions for all the respondents with the distributions for the forty-three very long-term students. Generally, there was no significant variation between the two distributions. However, in this case we found some interesting differences, as shown in Figure 13. Whereas 17% of the full group reported taking pleasure in their jobs from relating to other people, 33% of the long-term group described this factor as important to their work satisfaction. Having fun was mentioned by 18% and 26% of the two groups, respectively; and enjoying hands-on work was mentioned by 15% and 26% respectively. It would appear that the long-termers were a little more focused on the interpersonal aspects, the enjoyment and the experiential nature of their occupations. Figure 12 What makes jobs satisfying for the respondents. Figure 13 What makes jobs satisfying for the alumni who were long-term students. It’s a really good company. 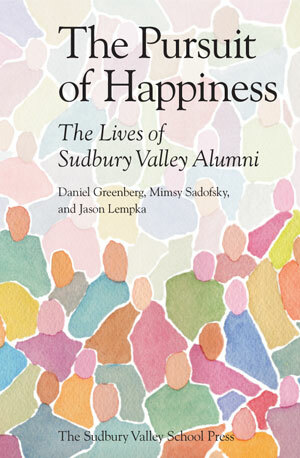 In some ways it’s sort of – I’m not going to say modeled after Sudbury Valley – but a lot of its practices and policies are related to self-motivation and empowerment, so you really get to exercise personal initiative. They treat you really well, and pay you pretty well. It’s a good job. I love the company. I like the people in the company, and the company treats me great. I’ve been there a long time, so I’ve got a lot of seniority, and I have an excellent position. I feel as though I'll probably work there until I retire. I was running a store. I was the store manager. But what we were doing was really building the infrastructure in terms of how to hire, and how to train, and how to open new stores quickly with quality staff and quality service, by following guidelines so that you could get the same product at every store, that kind of thing. So I was running a store, but I was also doing all this other stuff. We had lots of fun; we put our heart and soul into it. I like the fact that I get to make my own decisions. I'm very much on my own throughout the day. There’s not a lot of supervision that I need to follow. I'm left to my own devices, for better or for worse, which I've found mostly for better. In fact, in almost all instances better. I enjoy the type of project-based work where it’s three to six months in duration and then you move on to something else, and you have ownership of that project for the time that you’re working on it. What I didn't like about my last company is that it took many years before you got an opportunity to really take ownership of things. You’re at a fairly junior level and there’s a fairly rigid hierarchy in a management consulting firm. Because my current employer’s strategic planning group is smaller than the staffing levels at a large management consulting firm, you tend to get more responsibility. I really love my job and I don't consider it just a place I have to go. My approach is that what I'm being paid for is to manage a café, to make sure that there is an ample and good variety of healthful food there for people to eat and that we don’t run out of things. I do that really well, but that’s not necessarily a job where you start at 9:00 and end at 5:00. That’s a job where you come in and see what’s there and you have a burst of energy and you do a bunch of stuff and then either you just plow through or maybe you stop and take an hour off and do something in the middle of your day and then come back. Who’s to say whether I'm going to leave at four o’clock in the afternoon or ten o’clock in the evening? It’s very open, so a lot of my leisure time is actually spent at my workplace, when I'm by myself in a practice room or in a good conversation with a fellow musician. If I want to duck into a rehearsal room for an hour in the middle of the day, I just do it. If I am enjoying having a conversation with someone, I'll just do it. I'll take half an hour off to talk with someone who’s interesting, and then I'll work more later. I joined a company and started making games for a living. I’m bringing joy to people now. A lot of the skills from my prior television work converted over to game design. I am doing game design, just taking all the parts – the art and the programing and all of that -- and crafting the environment that people will be playing in, and the rules, and all that. Good fun – not exactly work for a living. You know, a definite artistic environment, very relaxed. You have deadlines, but after television – a deadline every six months or something is no big deal after having a deadline of 10:00 every night. The military has treated me terrifically. For one thing, as a woman trying to make a wage and progress in any kind of a career, I think you get more fairness in the military than out. When I got eligible to retire – right about the time my first baby came – I told my boss, “It’s been great, but I think it’s time to hang up my Major fatigues and become a civilian.” But he said, “Well, not so fast, we’re starting to let people telecommute – it’s working out great for the Air Force. It’s very cost effective in the military to have people telecommute if you happen to be on a job that lends itself to that.” So I got out and became a reservist and went right back into the military historian field and it has been great ever since. So for the past four years I’ve been telecommunicating for the Air Force. Currently, I do it two or three days a week. I work at home and I’m doing a lot of transcribing and editing, mostly oral histories, lectures and interviews with people. Right now there is a real push to get stuff about Korea before the veterans are all too old to tell any stories. The World War II guys are still telling stories, but the stories are getting pretty farfetched in a lot of cases. How can you beat it? I sit at my desk and I look out at the mountains and at the eagles and I transcribe. It’s awesome. Pretty cool. I don't have to wear a uniform. I don't even know where my uniform is. It's an amazing combination of so many different skills and challenges – it's constantly creating efficient systems, it’s working with natural forces, it’s being outside. I’m a devoted cook and I love cooking with incredible ingredients, so it’s a way to surround myself with a dream assortment of vegetables a lot of the year. And I’m a social person – I like working with employees, and I like the way we market the produce, which is that dozens of families come to the farm once a week and pick up a basket of produce. We also sell at farmers’ markets -- so it’s very social and people just love it, which makes me feel good. It’s a wonderful way to raise a family too. I love hard work, I love using my body, I love working with machinery. I just really do love every aspect of farming, except sometimes there’s just too much hard work. But I actually love it. I wake up at dawn and I'm just so excited to go work on the farm. I'm depressed when it gets dark out and I can’t work anymore. I'm doing exactly what I want to be doing, which very few people can do. I live in an unbelievably beautiful area on a beautiful farm, and I’ve been able to pursue my dreams at a young age. The enormous percentage of the interviewees who are engaged in entrepreneurial work, or are in management positions, testifies to the extent to which challenge, creativity, and constant stimulation are an integral part of their daily work life -- so much so that it comes as no surprise that most of them take it for granted, and that not that many singled out these factors specifically as reasons they enjoyed their work. However, many of the remarks made on this subject caught our attention. I’ve been working in retail since I graduated. Well before I even went to college, I was working in retail -- and to me it’s interesting, it’s challenging. I manage a shop, I have a lot of people under me, and I’m in charge of a lot of things. I communicate well with my clientele in a very prosperous area in London—-- it's very rich actually, and it’s very challenging. Several people enjoyed the excitement of being busy in a multi-task environment. I get to interact with 400 different people, which is the best part of my job. I don't go sit at a computer. I don't sit down and just do one thing. I get to deal with complex issues in what I would call a seriously intense environment. That's the best part of it. It's different every day. There's always something. I work for an Internet start-up. There's no dress code, there's no hours. It's sort of very loose. As long as you get your job done, everybody's happy. It's not really high pressure, but we have a lot of deadlines, we have a lot of things that have to happen quickly, which is sort of the nature of the business. But that's good too, because it's never ever boring. I worked at a bank for about five months and that didn't really work out. I worked for a Boston based worldwide management consulting firm. I was an off-site technology coordinator for them, so I got to work with a lot of different people in the organization, primarily vice-presidents in the company, going around and basically being their tech guy around the world, wherever they traveled. The bulk of what I had to do was this: there were about fifteen core conferences around the world that we had to schedule and they would be for anywhere between 30 and 300 people. They needed IT infrastructure to support those people while they were at the conference, which basically meant replicating whatever support services they had at their home offices, which they were going to expect when they showed up at your door. So it was a matter of working with a lot of different vendors, working with a lot of different IT groups within the company, really having a lot of irons in the fire at the same time. I had a job at a real estate tax service through a temp agency. I think it was a very good experience. Now I've got two-plus years of office experience under my belt and I've juggled all kinds of tasks. I answered phones, I dealt with customers, I ran a mail room, I ran part of a department essentially when there wasn't anybody else. Time management was also important because the business is very cyclical and several times a year it is extraordinarily busy and then at other times it can be really slow. But those times when it's really busy, trying to handle that and juggle that is challenging. I remember one particular tax cycle where I was kind of my whole department, and it was so busy I was coming in early and staying late, and I still felt like I never got through the stuff. They have at least a thousand people working for them and a lot of them are from the Dominican Republic, Puerto Rico, Mexico. So I've had to learn to speak Spanish. I've had to learn to drive and operate loaders and fork lifts and stuff. I'm working on getting my commercial driver's license. I've learned a lot of skills, and I've also learned a lot about how other people in the world, other communities in the world, act and treat each other and how they think of our society in the US. That's kind of been a big eye-opener. It's been interesting. After I started going to art school, I continued to work for a house painter from my home area. It was just the two of us, and I didn't do it so much because I needed the money, or necessarily for the love of house painting, but I did it because I learned a lot from him, and I learned a lot about being responsible for somebody else's professional life. That was a really important experience for me and I still work for him when he needs extra help. Another graduate looked for a succession of jobs from which he could expand his knowledge in several related areas. I've never worked at anything just for the money. I like to keep it something I can learn from. I worked pressing herbal extracts immediately after I graduated SVS. I worked retail at a couple of other places, such as natural food markets. I worked at an organic farm; that was a great job. Now I work at a florist, because it involves flowers and people that I like. In every world there's always a little maverick fringe. I began by working in companies run by young women, starting up designers, so I worked the maverick fringe and made good friends with people who were a little different than the rest of the fashion industry. From there I moved to a larger designer which itself was actually known to be very different than the rest of the fashion industry. It was a very nice atmosphere. I taught for a year and a half at a public high school in Manhattan, one of the inner city schools. It was a really amazing experience. The diversity of my students was just astounding. I had kids from India, Dominican Republic, Africa, Puerto Rico, Jamaica, Bangladesh, Iraq, Iran. I built the program at that high school. My first year there they threw me into a room with a package of dry erase markers and no books, no piano, no music, no equipment, no television, no nothing. They just put me in a room and handed me 300 kids and said, "Teach music!" I built everything that program had. This was a business school, so obviously music wasn't necessarily everyone's favorite topic, but I had wonderful kids. I had no discipline problems after a while, which was sort of unusual because I was new, I was young, and I had a lot of special needs kids that were being mainstreamed and they were wild. I don't know exactly what it is. I'm good with teenagers, so I guess it worked out somehow. As a general rule, all the things that I do tend to be sort of ongoing things so that while, yes, I try to be open to particular spontaneities that might improve a particular piece, there definitely is an overall long-term drive that is the ultimate governing factor of whatever I'm doing. Depending on which mode I am in, I might be spending an entire day just foraging around in a landfill looking for bits of scrap material that would be the right things for repairing the various items from one of my main collections, or I might spend an entire day just running back and forth between the different areas of the shop and working on fixing things, or I might be working entirely on my website or going out and trying to do something in terms of publicizing the project, schmoozing the people in galleries, etcetera, or doing performances in various venues, both to publicize my work and also just for the sake of doing it. For the most part I've been pretty much involved with my own projects. I mean obviously I have worked, but for the most part I've tried to get jobs where I could pick up skills that would be useful to me for my own needs - getting a paycheck and hopefully picking up a little bit of knowledge, like working in a photomat, where I got to develop my own pictures. I also worked briefly doing museum restoration work, from which I picked up a lot of good techniques. Many of the respondents indicated that they enjoy their work because it adds meaning to their lives. Their replies revealed a great deal about their personal value systems. Since I've been out of college, I've been working in libraries, children's libraries, and I find that really meaningful. It's kind of my mission to change libraries to be more open. I think there's a lot of potential for libraries to use their meeting space for a whole host of things that they don't use them for now. For example, I have teenagers come into the library and they bring bands and they play music after the library is closed. This summer we put on a play where the high school students were teaching the younger kids improv acting. I think that libraries in the old-fashioned sense are unfortunately - or fortunately - kind of defunct. My vision of a library of the future is a space where information on all kinds of different platforms can be exchanged. I was the executive director of the Arts Council of my town for two and a half years. It certainly wasn't the pay that I really enjoyed, because as a nonprofit they didn't pay very well. But I worked on a project that had a lot of impact on the community. We took an old library building and, with a nineteen-member board of directors, we were able to raise $1,800,000 to restore it. It was remarkable because we are in a very remote area. There aren't any big industries, no high-tech corporations, so all of our funding had to come from private foundations and local individuals and small donations from businesses - a lot of really small donations and some fairly substantial ones. It was a big undertaking, something that a lot of people said couldn't be done, and now it's a cornerstone of the community and it's really being recognized. There are things that I initiated that have become pretty well established, like what we call the Cultural Round Table, which is a coalition of cultural organizations. It was basically a means of getting people together to talk, to have an opportunity to discuss problems and difficulties, and to enable a way to work together. There had been the feeling of competition, and this forum provided a way to schedule things so that you weren't, for instance, having performances on the same day as someone else and then ticket sales would suffer as a result, that kind of thing. That idea was then taken by the regional Arts Council, and now they're using these Cultural Round Tables and have established them in each of the six counties that make up the region. We have a Cultural Trust, which is fairly new, an endowment fund to fund the arts in the state, and they are looking for ways to distribute the money. They were going to send funds to the cities in the rural areas, but now they're finding that because of the Cultural Round Tables, they can send the money there, and then have a system set up where people can apply for the funding from a local organization. So one little tiny thing that I did has mushroomed into a really big thing. Artists are coming out of the woodwork. Now they have a place to exhibit their artwork, and a means of marketing it, and art education. That's going to impact the livability of the area, it's going to impact people wanting to come here - doctors and professionals and people like that - and it's increasing things like art fairs and sidewalk fairs. All of these activities now have a place to come together. I worked for a large environmental organization. We worked on creating a code of environmental conduct for corporations and on a system which they could use to report annually on their compliance with those principles. It was to be used by people who wanted to invest in companies that represented their own personal views, and wanted some objective way of measuring whether their corporations were, in fact, meeting those criteria. I worked with an excellent group of people, comprised of individuals from a number of nonprofit organizations in the environmental field, and from different religious organizations and institutions committed to conservation. I felt the work I was doing was very valuable because I felt we were helping to change corporate environmental practices for the better, but then in addition to that, the people I worked with were just terrific individuals and I made friendships that are continuing to this day. That work convinced me of my need for further training and education in environmental science and natural resources management. It not only led me toward graduate school, but also gave me some of the credentials I needed to get into the graduate programs I was interested in. I worked for the Public Child Welfare Agency in the city I was living in for nine years, and that was really meaningful. The bulk of the time I was a protective service case worker. I worked with children at risk of abuse and neglect and I provided the families with services. I removed the children from the home when they weren't safe and tried to reunite families that were apart. It was super meaningful work and very hard. Then I became a home finder. I trained foster and adoptive parents and made the placements. I coordinated which children went to which home, and re-evaluated the homes and lent them support. I really, really liked that job. People make a lot of snide remarks, but it was very gratifying. People are in terrible shape when they arrive to settle their loved ones' final arrangements, and I've always been a kind, sympathetic, patient person. My work used a combination of every talent I've got. It was a good job for me as far as being rewarding in a spiritual way. I've got a whole box of letters from families thanking me for being so kind and helpful - and not trying to screw them. My floor is for wanderers and behavioral problems. On my floor there are two women who are in their late 80's. I called them "my two little wanderers" because they wandered around but they always looked for each other. They don't know what planet we're on, they don't know what's going on, but they know each other. The administration decided to separate them. So I had a disagreement about moving one and not the other. The one they decided to move had just gotten back from the hospital and she was very frail. On the day of the move she was very upset, so I told one of the administrators, "I need someone else to be in the recreation activity so I can help her" - you know, I had 20 or 30 other people to look after. So she called, and someone in Social Service came up and said about my patient, "Who's Jean?" That's how well they know their clients! I explained the situation. I said, "I don't know who made this decision and I don't have any medical background, but I think it's a very bad idea because it's just going to upset both of them and I think they're going to go downhill. Jean's in a really bad state." Well, I got in trouble for speaking up for my residents' interests. And this has been sort of ongoing. I've seen the residents' families - they're all very upset about this - and I talked to them about it. I fully acknowledged to them that I disagreed with what the administration decided to do. So, I'm just sort of waiting for the other shoe to drop. I spend eight hours a day with these people, and I know them, and someone comes in and says, "Who's Jean?" I don't think it's right. What I'm doing right now is substitute teaching, working with special-ed kids, which I really love. The pay is so low that you might as well say I'm volunteering. I don't really have to be working at this point in my life; I do it just because I really enjoy it. The kids dread it because here's a substitute and how much help can she possibly be? She doesn't know the kids, and some of the programs the kids are on are very involved, lots of subtleties. Also, kids with special needs may not respond well to changes and different faces. That alone can set them off sometimes; it's really hard to have a stranger among them. There were a couple of times where I walked in the door and people were openly upset. By the end of the day it was like, "Thank you so much for coming!" They might as well have just said, "We really thought you'd be a dud." So it's been rewarding. What I have found interesting is that very quickly people realize that I have some experience, I have something to bring to the table, and quite honestly I feel like now everywhere I go I'm respected. People know that when I walk in the door I'm not going to be dead weight. I'm going to be able to get the job done. Now people are calling and requesting me directly, which makes me feel good. I had a ball when I was doing it. My students would tease me; my dance classes were referred to as "philosophy classes." I would say, "Anybody can do a tendu. Who cares about the actual movement? If it doesn't mean anything. . ." So that was sort of my bent. Teaching is not something where you get a lot of instant gratification. I'd come back two years later to do something at the university and I'd run into a former student and he'd say, "Oh, man, what you taught me two years ago has really influenced how I see life in general." They would say, "It changed my life, blah, blah, blah," and I'd be thinking, "God, why did it feel like I was pulling your damn teeth? Why couldn't you just give me something at the time?" As I age I realize that that's the way it is, and it's not about instant gratification. But, oh, sometimes it is. You know, you have students who just take off! They hook into your style. Over the period of time that I taught there I saw people really develop. I'd teach them in one class and then the next year I would teach them again. I'd see their development and be blown away by it. It was really exciting. I had never worked harder in my life than I did in East Timor. The first three months that I was there, it was still an emergency situation, and we were doing anywhere from twelve to eighteen hour days, seven days a week. But I was so charged. I enjoyed the work and it needed to get done. If you have a job in an office it can be like, "Oh, dod I do the filing today or do I do it tomorrow? It can wait until tomorrow, no big deal." But when people are waiting for shelter materials and until we bring them they're going to be living under a tarp issued by the UN, it's a whole other thing. I found that very challenging, very rewarding, but it also puts a lot of pressure on you. There were days when I just didn't think we could do it. People look at you and they think you're going to be bringing them materials so they can go ahead and build a house, and you're thinking, "I know these materials are not going to come from Malaysia or Indonesia for another three weeks, and how do I explain that to these people?" So it was very rewarding, but at the same time it could be very hard. I took the work not necessarily personally, but I certainly took it to heart, so when thingsdidn't go out when they were supposed to, that was very hard. But I actually really enjoyed the work until the very end. To me the cafe has always been about extension of the school's community. Before I started running it, all they had was pre-made snacks, ugly food, and basically, beer and soda. I turned it into a really vibrant, fun place for everybody to eat. I started making a bunch of really tasty food. I keep the prices really low by working with simple ingredients and doing the leg work myself, rather than buying prepackaged, pre-processed stuff that you have to sell for a lot because you paid a lot for it. My basic thinking was, if people eat together, then it will be an exciting part of the community. Rather than trying to run out of the building, teachers are going to stay in and eat with their students at a table. There's a real showbiz aspect to working in a kitchen. You're putting on a show and you're waiting for that time, 8:00, when the dinner's going to begin. You'd put all your effort into that and then you'd dance in the kitchen for a few hours and then there's that great feeling afterwards when you've accomplished it. There's a good brotherhood between the chefs just like there is between the players in a band. They're a rough and tumble bunch, which I am myself. They like to go out for a beer and stories afterwards. So I was actually very comfortable in that scene and it was a really good experience for me. A bartender exclaimed, "Waitressing didn't do it for me, but bartending I absolutely adore. It's a lot of fun, because you get to talk with people." The manager of a yoga studio enjoyed her work because of the "give and take of the whole thing. Everyone's kind of evolving, somewhat together and somewhat not, and it's like a bunch of friends and a bunch of people kind of helping each other." An assistant manager in a supermarket found it "was a fairly interesting job. There were about forty employees in the department. Over half of them were from other countries, and some of them barely spoke any English. It was definitely a learning experience. Obviously you can find people to translate, so it's not like you're learning the language or anything. I found there are so many strange differences in people's attitudes from different cultures. Things you take for granted, like ways that you would phrase a question, or ways you would go about asking for something, can definitely be completely different than the way they would go about it. So it was interesting trying to manage these people. That was not something I ever predicted I would have to deal with." What I feel is really important in gymnastics is the camaraderie between the girls that makes it a team sport. I would have to say that if an elite gymnast walked up off the street and said to me, "Will you coach me as an elite gymnast?" I would probably recommend them to someone else. Since we don't have any other gymnasts like that right now in our gym, they would be extremely individualized, and I don't think that that's healthy for them. I think they need the companionship that they can only get from girls going through the same thing that they're going through at that time. We've got beautiful golf courses here and I love showing people. I feel like I'm sort of a golf ambassador, or an employee of the Chamber of Commerce, because I love the area so much. I bring people out and I walk them around the golf course and I tell them where their shots need to be and I get them to score ten or fifteen or twenty strokes better than they would have if they had gone out on their own. They become your best friend. I do things like make dinner reservations on the way back from the golf course, I tell them what sightseeing things they should do. So it's more than just bringing somebody out to a golf course and dropping them off. I've had a bunch of odd jobs, but an important one was working for a huge superstore chain. That opened my eyes quite a bit to corporate structure and made me realize that I never want to do it again. Although working there seemed fine at the beginning, I started to notice that it almost seemed fake, a fake smile, while behind the scenes, everyone was stressed out to the point of breaking. The face that they put forward was "Hi! How are you doing today!" Ugh. That's the way you have to act, but it went overboard because we had to act that way all the time, even to each other. If you're in a bad mood, you're in a bad mood. You couldn't show it. It was kind of weird. I ended up not being able to handle it. That kind of pressure didn't really work well for me, but I think that is true of retail business in general. It was a very high stress kind of job. It gives you more of a feeling of what's going on when you go into a store next time. I worked for an ad agency for a little while and I got to know exactly what they were about and how the whole program worked and the sequence of what you do to get into what position. That was very important information for me. I decided I didn't like it too much, and set out to pursue my own business and go into freelance work, which worked out very well. I was a producer-director at a TV station. I ran the news depart-ment, built a new set, had a jazz show that was nominated for a Cable Ace Award. Then I left there and I went to a big-city station as an editor, but I started getting disheartened with the news. Because the big lie is that you're out to tell the truth - that it's not really about ratings, it's about telling the truth. And the real gist is, it's really just about advertisers, and you don't want to piss off the wrong people. It's just very corporate. Also I spent seven years doing local news, so most of my time was spent doing murders and fires, etc., and I wondered, "Who am I really helping with this?" I felt like all I was doing day-in and day-out was bumming out the public at home. While I was working at a Planned Parenthood clinic, we had a violent attack there. A man broke in and trashed the place. He didn't have a gun but he did have a huge brick which he threw through the reception glass window in order to break in, and a bunch of us were there. It was very scary. It's just a miracle that none of us were hurt because we were all standing right there when the glass window shattered everywhere. After this incident, which happened when I was twenty years old, I continued to work at Planned Parenthood until I was about twenty-five. I had just started working there when this happened. A year later I left - I was totally burnt out, and I took a few months off. But I wound up going back because there's a joke at Planned Parenthood: you never leave. That repeatedly happened with staff. They would leave and then come back a few months later, a year later - people always came back. When I finally left, the clinic director said to me, "How many going away parties have we thrown for you?" I said to her, "I've had three." But I have not been back since and I don't plan on going back. Ever since then I feel like I don't want to work in a place where my life's in danger every day. Reproductive freedom is something very important to me, but I don't want to work in a clinic. I don't want to live like that anymore. So I admire people who do it, and I'm proud of myself for having done it, but I don't ever want to do it again. On one difficult assignment in a third-world country, the first few months there I loved it, and then we had a problem in my office where I discovered that about 25% of the staff were committing fraud and trying to steal money from the agency through medical benefits. The idea was, if they need to see a doctor, they see a doctor, they get a receipt, and they get reimbursed. But people were writing bogus receipts. So I sort of figured out what was happening, did some investigation, talked to the country director, and I then had to fire a lot of the staff, which in any environment is a bad thing to have to do. In a country where you have 80% unemployment and you know people's children will be hungry after you fire them, it's extremely difficult. On top of that, some of the staff were very upset with me because I had discovered it and I was the front person. Even though I was not the one who made the decision for them to be dismissed, I was the one who handed them the pink slip, so there were a lot of former staff who were very unhappy with me. People were going to see witch doctors, and putting spells on me, and it got really kind of strange. So I wanted to get out of there, not so much because I wanted the comforts of home, but rather because I had staff coming up to me and saying, "Look, be careful. There's some people who are not doing good things." Well, I have days and then I have days. Sometimes I find the whole PC troubleshooting aspect of my job very wearing. My impression from talking to people and reading the literature is that pretty much all librarians find that. Before computers, it was the copier that was always broken. Librarians tend to be people who have advanced degrees who are interested in either the scholarly aspect or the working with people aspect, and then find themselves stuck with these machines as well. Since I work in a public library, I see a broad spectrum of human beings, everybody from toddlers to their great-grandparents, and therefore I get a broader spectrum of questions than I might if I worked in an academic setting. I also don't tend to get the more scholarly sorts of inquiries. So I do have days when I feel like my brain is atrophying. In effect, I'm on a public service desk and I'm there for whatever people need from me, including "Where's the bathroom? ", which is the other big joke amongst librarians. We went to school to get a Master's degree so we can tell people where the bathroom is. I had a really lousy office job for a while - very, very miserable - in which I was just stunned at how people were never given the authority or trust to do their job well. There was an office manager, the owner, looking over your shoulder every moment. It was very distracting. I came to realize that was how many work places were structured, and I guess my objection to it is similar to my objections to traditional school. The idea that people can't just be told the things that have to be done and left alone to do them, but have to be micro-managed, grows out of the same culture that is created by, and created, the traditional school model. Obviously I didn't have any fun, but I think that job had a significant role in making me who I am. I think that it made me more realistic about how deep the philosophical gulf is between what I view as the way to live one's life and the way much of the world seems to view it.